Forum Description: This is the area for all general slugging comments. To add a comment simply create a new topic or see FAQ for detailed information on how to post comments. Construction work along Eads Street between the Pentagon Reservation and Army Navy Drive has begun since June 21 to prepare for traffic signal installation and roadway improvement. The Eads Street construction work will be completed in several phases this summer and continue through the fall. The current Phase 1 of the Eads Street construction work is near completion. Phase 2 of the Eads Street construction work will begin on or about ***Monday, July 16***, subject to weather conditions, and will require extensive traffic pattern changes throughout the day. Your commute and travel plans will be significantly impacted. On or about Monday, July 16, Phase 2 of the Eads Street construction will begin along the west side of Eads Street (existing southbound travel lanes) to demolish concrete, widen pavement, and install drainage, sidewalks, overhead structures, and curb and gutter in preparation for the 4th lane addition on South Rotary Road to access the future 395 Express/Toll Lanes. Duration of Eads Street Phase 2 construction work will take approximately 6 to 8 weeks, or mid to late September 2018, subject to weather conditions. All traffic along Eads Street between South Rotary Road and Army Navy Drive will be shifted to the east side of Eads Street (existing northbound travel lanes), with access to the I-395 HOV Ramps preserved. There will be different restrictions and detours during the AM Peak between 6:00am to 9:00am, the off-peak period from 9:00am to 3:00pm, and the PM Peak from 3:00pm to 8:00pm. Detours with signage are set up on Eads Street, South Rotary Road, as well as surrounding roadways such as Fern Street (see attached diagrams). Intermittent/Temporary Nighttime and Weekend Closures of Eads Street may occur. Detours with signage will be set up to re-direct traffic. As current traffic volume along Eads Street is near capacity during peak periods, we expect significant traffic congestion and delays along Eads Street and access to I-395 HOV On-Ramps. Employees are encouraged to plan ahead, map out alternate routes (see attached for alternate option), allow additional time for travel, and consider alternative modes of transportation, including regional and local public transit buses and Metrorail. Drivers and pedestrians are also encouraged to exercise safety and caution, follow signage and traffic control directions, and avoid Eads Street as much as possible. Detailed information about Phase 3 of the Eads Street construction work will be provided as we approach the Fall. Visit http://www.395expresslanes.com/pentagon" rel="nofollow - www.395expresslanes.com/pentagon for more information. If you have any questions, please contact the WHS TMPO at whs.pentagon.em.mbx.dod-shuttle-bus@mail.mil. 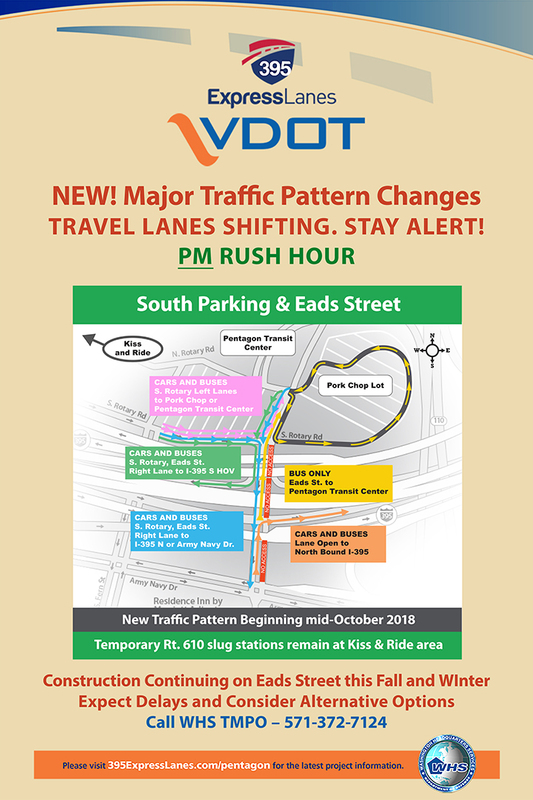 TMP Newsletter July 2018: Traffic Changes at Eads St; Temporary Relocation of Slug Stations Construction work continues at the “Pork Chop” and along Eads Street between the Pentagon Reservation and Army Navy Drive as part o f the 395 Express Lanes / South Parking Improvements Project. Construction began along the west side of Eads Street (existing southbound travel lanes) on July 16, 2018 to demolish concrete, widen pavement, install drainage, sidewalks, overhead structures, and curb and gutter in preparation for the 4th lane addition on South Rotary Road to access the future 395 Express/Toll Lanes. Duration of construction work on the west side of Eads Street will take approximately 6 to 8 weeks, or until early/mid-September 2018, subject to weather conditions. All traffic along Eads Street between South Rotary Road and Army Navy Drive is shifted to the east side of Eads Street (existing northbound travel lanes), with access to the I-395 HOV Ramps preserved. There are different restrictions and detours during the AM Peak between 6:00am to 9:00am, the off-peak period from 9:00am to 3:00pm, and the PM Peak from 3:00pm to 8:00pm. Detours with signage are set up on Eads Street, South Rotary Road, as well as surrounding roadways such as Fern Street. Intermittent/Temporary Nighttime and Weekend Closures of Eads Street may occur. Detours with signage will be set up to re-direct traffic. Additionally, two slug stations by the motorcycle lot, 610 Mine Road and 610 Stafford, are temporarily relocated to North Rotary Road towards the Pentagon Memorial to alleviate traffic congestion along South Rotary Road, Eads Street and Fern Street. This temporary relocation is planned to be in effect during Eads Street construction. Information on the detailed traffic pattern changes are posted on 395ExpressLanes.com/pentagon. Updates on the next phase of the Eads Street Construction (east side of Eads Street) will be available as we get closer to September. You can also follow us on WHSTransportation and @WHS_Transport: #395ExpressInfo. Remember to practice safety, follow signs and traffic control direction, and be familiar with travel alternatives. ·Ongoing construction activity at I-395 HOV on- and off-ramps on Eads St. at the Pentagon Reservation will lead to a lane shift in traffic patterns and delays. These new traffic patterns begin Monday, October 15, 2018 and continue into January 2019. ·Drivers should follow updated signs and the direction of traffic control officers, and review the new traffic patterns shown. Note that drivers dropping off passengers at the Pentagon in the AM rush hour and continuing to DC or Crystal City will need to detour to Army Navy Drive to reach the I-395 North HOV on-ramp. ·There is no change to current locations for AM drop-offs or PM pick-ups. ·In the event of significant congestion during the PM rush hour, drivers should be prepared to take alternate routes to I-395 South HOV lanes. See https://www.395expresslanes.com/pentagon" rel="nofollow - https://www.395expresslanes.com/pentagon for more details. Construction work continues along Eads Street between the Pentagon Reservation and Army Navy Drive. The VDOT construction crew is making good progress on the west side of Eads Street to widen pavement, install drainage, sidewalks, overhead structures, and curb and gutter in preparation for the 4th lane addition on South Rotary Road to access the future 395 Express/Toll Lanes. Two slug stations, 610 Mine Road and 610 Stafford are temporarily relocated to the kiss and drop areas by North Rotary Road as a traffic congestion mitigation for the duration of the Eads Street construction work. Pentagon personnel and regional commuters adapted to the detours and temporary change in traffic patterns. There will be additional weekend construction work at the “Pork Chop” for the next few weeks. Beginning on August 24, 2018, the Pork Chop closes on Friday nights at 6 p.m. and remains closed until 4 am the following Monday morning to allow construction crew to perform drainage work. Slugging activities in the Pork Chop may continue until 8 pm on Fridays. Vehicles that are not removed by 6 p.m. on Fridays through September 17, 2018, will be towed at owner's expense. To locate a towed vehicle call the Pentagon Force Protection Agency (PFPA) at (703) 697-1001. The next phase of the Eads Street construction will occur on the East side of Eads Street around the end of September to early October, subject to weather condition. The current travel lanes will switch to the West side. Please be prepared and pay close attention to signage as they will change to align with the new traffic patterns. More information will be available in mid-September. Information on the detailed traffic pattern changes will be posted on 395ExpressLanes.com/pentagon. You can also follow us on WHSTransportation and @WHS_Transport: #395ExpressInfo. Remember to practice safety, follow signs and traffic control direction, and be familiar with travel alternatives. Lane Reduction: All traffic along Eads Street between South Rotary Road and Army Navy Drive will be shifted to the west side of Eads Street on or about October 15 through the winter months. AM Peak Changes (6am – 9am): Right-turn from S. Rotary Rd. to I-395 S HOV Only, no Army Navy Dr. access from S. Rotary Road and Eads Street. No Pentagon Access via Eads Street Northbound. I-395 N Detour via Fern Street and Army Navy Drive. Off Peak (9am – 3pm): No significant changes, all four (4) lanes open on South Rotary Road. Information on the detailed traffic pattern changes will be posted on 395ExpressLanes.com/pentagon. You can also follow us on WHSTransportation and @WHS_Transport: #395ExpressInfo. Please be prepared and pay close attention to signage as they will change to align with the new traffic patterns. Remember to practice safety, follow traffic control direction, and be familiar with travel alternatives. Visit the new Pentagon Commuter Store located at the Pentagon Transit Center for travel assistance. Construction work continues at the “Pork Chop” and along Eads Street between the Pentagon Reservation and Army Navy Drive as part of the 395 Express Lanes / South Parking Improvements Project. On Monday, October 15, the traffic pattern at Eads Street has changed with traffic switching to the West side of Eads Street. (southbound travel lanes), with access to the I-395 HOV Ramps preserved. The temporary relocation of Route 610 Stafford and Mine Road slug stations will remain at the Kiss and Ride area on N. Rotary Rd during the Eads Street construction. Off Peak (9am – 3pm): No significant changes, all lanes open on South Rotary Road. PM Peak Changes (3pm – 6pm): Some transit buses exit Pentagon Transit Center via Connector Road. Delays and congestion anticipated. No Pentagon Access via Eads Street Northbound. Drivers should follow signs on South Rotary Road for turning movement. Beginning next Tuesday, January 22 (subject to weather condition), the traffic pattern at Eads Street will change. Both sides of Eads Street will reopen, but the same traffic restrictions in the AM and PM peak are still in effect. The temporary slug relocation of the 610 Stafford and Mine Road stations will continue to be on North Rotary Road through the duration of the construction at Eads Street. Additionally, the following is our transportation advisory for the upcoming traffic pattern change. Please also note that the 395 Express Lanes website has a new look and a new URL at https://www.expresslanes.com/projects/395" rel="nofollow - https://www.expresslanes.com/projects/395 . If you have any questions on the 395 Express Lanes website, I have included Brent McKenzie on the cc line to this email. On or about Tuesday, January 22, 2019, the day after the Martin Luther King, Jr. Day and subject to weather events, the Eads Street traffic pattern will return to one lane on both sides of Eads Street, inbound and outbound, while construction continues. If inclement weather is encountered this weekend, the traffic pattern change will occur the following Monday, January 28, 2019. The current traffic restrictions and detours during the AM Peak between 6:00am to 9:00am, the off-peak period from 9:00am to 3:00pm, and the PM Peak from 3:00pm to 8:00pm will continue to be in effect. Please see attached diagrams for complete details. The temporary relocation of Route 610 Stafford and Mine Road slug stations will remain at the Kiss and Ride area on N. Rotary Road during the Eads Street construction. Please pay close attention to traffic control direction, signage and traffic signals as they will change to align with the new traffic patterns. Visit https://www.expresslanes.com/projects/395" rel="nofollow - https://www.expresslanes.com/projects/395 for more information. Construction work continues at the “Pork Chop” and along Eads Street. The temporary relocation of Route 610 Stafford and Mine Road slug stations will remain at the Kiss and Ride area on N. Rotary Rd during the Eads Street construction. 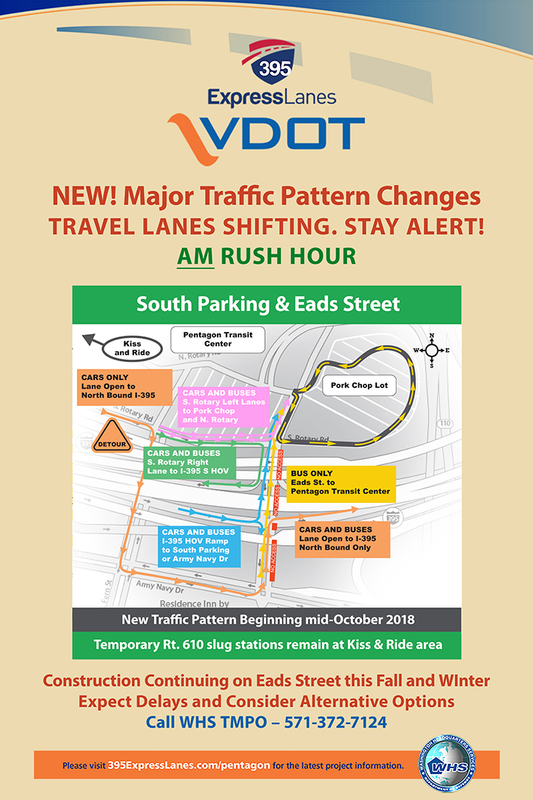 TMP Newsletter February 2019: Since January 22, 2019, the Eads Street traffic pattern has returned to one lane on both sides of Eads Street, inbound and outbound, while construction work continues along the median. The temporary relocation of Route 610 Stafford and Mine Road slug stations will remain at the Kiss and Ride area on N. Rotary Rd during the Eads Street construction.